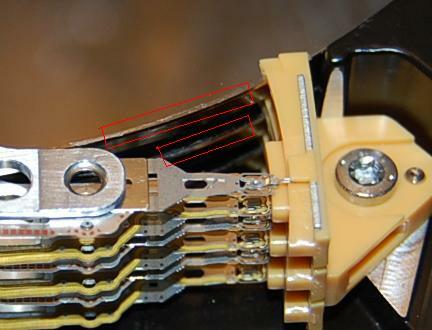 When performing hard drive data recovery, it is often a physical problem that requires the disk to be opened. We open hard drives in our clean room to prevent dust and static charges to interfere with the media. Our most commonly faced problem is head failure. The heads float on a tiny cusion of air that is generated by the spinning platters. A brown out or drop in electricity or excessive heat can make the heads impact on the platters. In external hard drives, being dropped or suddenly losing power can also cause an impact. Every now and then the heads will impact on the platters and cause scratching. This is as bad as it gets as the scratches are eliminating ones and zeros. In the photo below, the scoring of the platters is on the very edge of the media. This cuses severe damage to the heads which have to travel over the edge of the platter at every read and write. Even if we replace the heads, the new ones will soon become damaged as well. To learn more about your options when facing a clicking or grinding hard drive. Call us at 727-354-9665 or visit our hard drive data recovery page. I don’t know how much “damage” I caused, but I took my hard drive “platters” completely of the spindle with the intent of simply placing them into another working hard drive from the same maunfacturer BEFORE I found your site. I was VERY careful in removing them, but now my stomach is sunken in my lower bowels because the ENTIRETY of my photography work since 2004 is on this drive!! I am in Afghanistan When I accidentally plugged the charger for my laptop into this hard drive. I just wonder whether you can still get my data off it? How would I send them, plus all the hard drive’s “pieces”? I am completely distraught, as you can imagine, and am looking for ANY ray of hope. Thank you. maybe a dumb question, but what about turning power off to idle external USB connected HD after copy files done writing, without full system shutdown? Hello i have two harddrive 80 gigabyte they are all not working because they pwer kill the so i don’t know how much it wlii cost me .